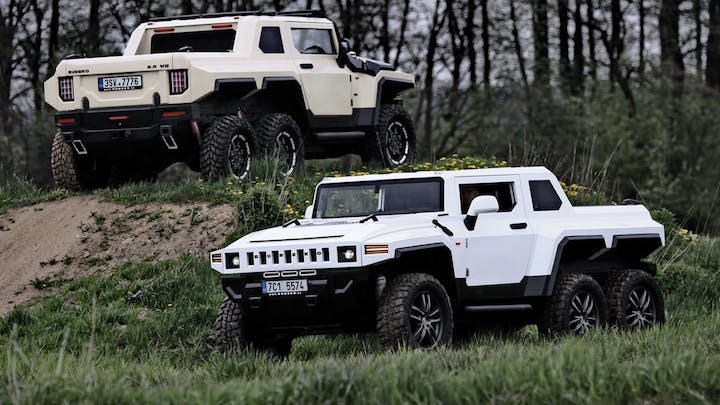 The weird creation you’re looking isn’t a new Hummer H3T concept, but the Bureko 6×6 – a custom, six-wheeled Chevrolet Silverado built by a company in the Czech Republic. With three axles, lifted suspension, an LED light bar, bed mounted spare tires and aftermarket wheels wrapped in off-road tires, the Bureko 6×6 is ready to go just about anywhere. Under the hood of the base model is the Silverado’s 420 hp 6.2-liter V8 engine, however Bureko also has a selection of rather tame upgrade engines available ranging in power from 600-800 hp. If you’re feeling really crazy, there’s also 1,000 and 1,200 hp versions. The company says the truck measures in at 20 feet and 4 inches long for the Crew Cab version (there’s also a Double Cab-based model) and 7 feet and 1 inch wide. 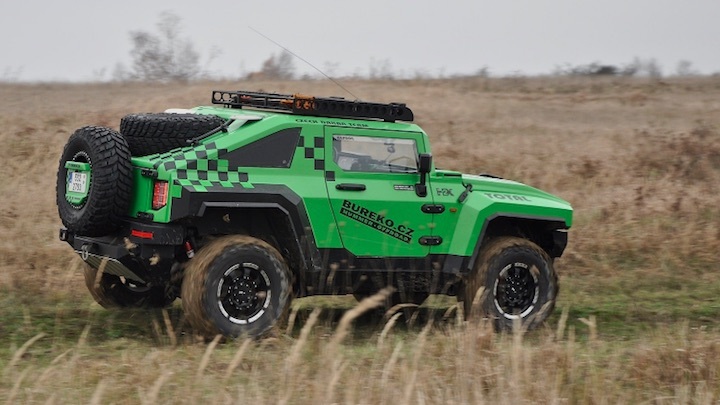 The Bureko 6×6’s Hummer-like looks are no accident – the company has produced a few other Hummer-inspired models as well. 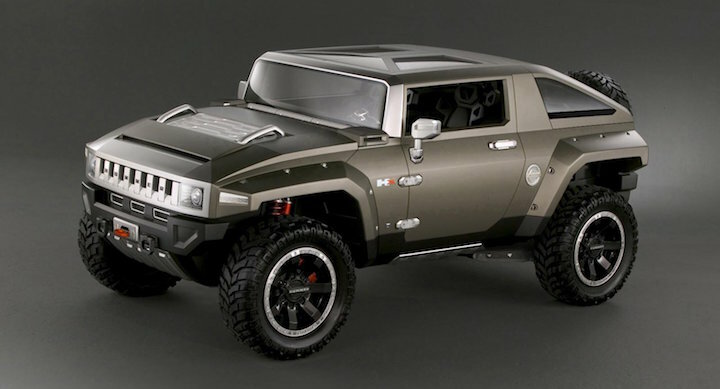 Its first vehicle, the Bureko 4×4 (below), was inspired by the two-door Hummer HX concept (above), which General Motors first showed at the 2008 North American International Auto Show. After the 4×4, the company introduced the first 6×6 model (also below), which appears quite similar to the 4×4 model. 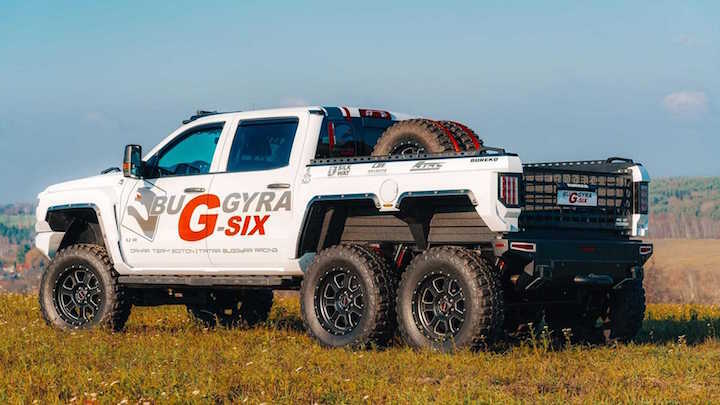 It’s not clear what the base price of the new Bureko 6×6 is, but considering the amount of work involved in converting the vehicle from a standard Silverado into a 6×6, along with the costs of buying and importing a 6.2-liter V8 Chevrolet Silverado to the Czech Republic, it seems doubtful that this weird creation is very affordable. For additional information and photos, be sure to check out Bureko’s website. Like this story? Subscribe to GM Authority for more Chevrolet Silverado news.